I have been working away on the second block of “Love is in the Air” a pattern designed by Lori Smith. I purchased this pattern a couple of years ago and put it away with the rest of my patterns. Honestly, I forgot all about it. About a month ago, I went through my patterns and books in search of a simple applique pattern that would lend itself to a really scrappy feel. As soon as I “found” this pattern in my box of (far too many) patterns, I knew “Love is in the Air” was exactly what I was looking for! For those of you who may want to stitch these blocks along with me, the pattern is available here. As I mentioned in my last post, I am using a collection of shirting for the backgrounds, so that means that each background square will be different, which I am not going to lie has me a little unsettled. But I do love a challenge! Also, I enlarged the patterns by 125%. I cut my background squares 16″ x 16″, but I am not sure right now what size they will end up. I never have all the details figured out before I start a quilt….what fun would that be? Sometimes you have to listen to the quilt! I started this block by tracing the pattern onto the background with a water soluble marker. Next, I made a bunch of leaves, using many different fabrics, just for the fun of it and then I auditioned them. Some I like. Some I don’t. Some of the leaves are competing with the background, so I will save those leaves for another project! OK, next I added my stems. Notice I used the same fabric for all of the stems, just to give a bit of consistency. Next, I went searching through my scraps and I found this piece of fabric I have had for about 8 years. I love this fabric! So I decided to use it for the 4 main flowers. Then I went through my scraps and found a fabric that went with the flower fabric. Next, I went through my blues and golds and chose a few fabrics that played nicely with the main flower fabric. So far, so good! This patterns has a circle in the centre that I could make with a piece of bias and a 1/4 bias maker, but I chose to make a template instead and prep it in the way I prep all of my templates. So much easier! Instead of tracing the circle from the pattern, I used a compass to get a more accurate shape. I cut the circle out and ironed it to the wrong side of the fabric. I decided not to cut the centre of the fabric out just yet, to keep it more stable. Using starch, a stiletto and a mini-iron, I prepped the outside edge. Next, I trimmed out the centre and prepped the inside edge. Taking the freezer paper out is always fun (and kind of scary!) but it works like a charm every time! Once it is glued in place, it looks very neat and tidy. Whew!! So, I auditioned several fabrics for the centres of the main flowers…brown, black, burgundy, blue…nothing appealed to me. Then I tried gold. Gold it is!! But wait…. I thought the gold circles were a tad too big, so I made them a shade smaller. Here’s a fun fact… I used three different golds in this block. After all, it is a scrappy quilt! And here are both blocks. Sweet! Keeping with the scrappy theme, I am working away on Trail Mix, a quilt designed by Laundry Basket Quilts. I chuckled when I saw this block. …a scrap of the background of my Civil War Bride Quilt…. ….and a piece of the background of my Reminescence. Memories! Thanks to Rebecca at Cheeky Cognoscenti for tagging me in the “Around the World Quilt Blog Tour”. I am so flattered!! Before you read any further, make sure you check out Rebecca’s blog and see if her Pineapple Quilt doesn’t give you goosebumps! It gives me wild goosebumps every time I see it!! The idea of the “Around the World Quilt Blog Tour” is to answer 4 question and then tag another quilter to keeps things rolling. So….here goes! Question 1. What am I working on? Oh! I am so glad you asked!! As with most quilters, I like to work on more than one quilt at a time. I think this keeps things fresh and exciting. If you have read my blog before now, you probably know that I am obsessed with hand-applique and hand-quilting….and hexies! To be honest, obsessed is putting it mildly! I made my first quilt when I was 15 and I have been quilting in one form or another since then. I have made more than my share of machine-pieced quilts, but it is hand-applique that has captured my heart. I discovered the world of hexies earlier this year. It is an addictive world! The binding is almost stitched on my Grandmother’s Flower Garden. I used the English Paper Piecing method to make this quilt and I hand quilted it. I decided long ago that if I am going to quilt by hand, I really want the quilting to show up, which is why I chose to use a Baptist Fan pattern. Here are some more hexies that I have played around with and some that are ready to be stitched. There are definitely more hexie quilts in my future! Next, is “To Everything There Is A Season“, my own Block-of-the-Month that I had designed by Marilyn at MTDesigns, a talented artist who takes my unorganized, vague ideas and turns them into awesome quilts! The patterns for these blocks are also available on my website. Along with the 12 blocks, there is also a centre medallion, which would also make a lovely stand-alone wallhanging. There will also be borders surrounding the entire quilt. Each time I complete a block, it my “new favourite”! This is Peggy’s Puzzle (also designed by Marilyn at MT Desisgns) and it is almost finished! Some of you have been making these free blocks that are available on my website Simple Bird Studio. I had this quilt designed with beginners in mind and even made some Youtube videos to go along with each block. This will be my next hand quilting project. Can’t wait to start! This is my “Friends of Baltimore” which I have been working on longer that I have been blogging. These are the blocks I had completed when I wrote my first blog post. And this is where I am now! So many people have contacted me and said that I have inspired them to begin this “once-in-a-lifetime” quilt. That is so nice to hear! Believe it or not, these blocks are not difficult. Time consuming? Oh yes! Lots of pieces in each block? You bet. But they certainly are not difficult if you have experience in whichever method you choose to hand-applique. This year I completed my Civil War Bride Quilt, which is hanging in our living room. I look at it and wonder when the heck I had all that time to make a quilt like that. I tend to work in smaller chunks of time, as opposed to larger spans of time. All of those smaller chunks of time add up. Like most quilters I know, I go to work, make dinner, do laundry and so on and so on. But I make the time to quilt every single day! I also have been trying to get in 10,000 steps each day. If I could figure out a way to stitch and walk at the same time, I would be all set! Last year I taught a Beginner Class (we used the Peggy’s Puzzle pattern) and this year I am teaching them the skills to make a Baltimore quilt! Here is the first block. I am using pinks, burgundy’s, reds greens and maybe a touch of blue and gold. I am also working on Sue Garman’s “Ladies of the Sea”. I have 3 blocks completed and I am going to start one of the borders next, just so that when the blocks are all done I won’t get overwhelmed with the borders. I saw “Ladies of the Sea” in a magazine a few years back and my jaw dropped to the floor. I knew I had to make it for my son, Chad, and I ordered the patterns right away. I also just finished hand-quilting “Circle of Tulips” (another free pattern on my website). I made these blocks around 15 years ago when I was teaching myself various hand-applique methods. I kept these blocks around with the thought that one day I would do something with them. So last year I stitched the blocks together and quilted it by hand. I knew exactly how I wanted it to look. I wanted it to look antique and dainty with a scalloped border. Mission accomplished! This quilt (a pattern in Quiltmania 100) caught my eye and I have been slowly collecting fabrics for it. I am anxious to get started! These are my blues (so far) and the background. …and ended up with a black cat and a red bird. I also don’t mind showing you how I was getting ready to stitch my bias stem, only to realize I glued it in place, wrong side up! Or washed my block without first making sure that everything was stitched in place. I want everyone to know that hand-applique is very doable, you just need to learn a few skills and practice those skills! 3rd Question: Why do I create? I think that eveyone is capable of creating beautiful works of art, whether it is a quilt or a symphony or a painting or wonderful meal. I feel so fortunate that I have found an outlet to express myself in a way that I love. I am creating a legacy of quilts that I hope my family will cherish for many years. Hopefully, they will realize there was more to my life than the cooking and cleaning and doing the laundry! 4th Question: How do I work? The more quilts on the go, the happier (and more productive!) I am. I think that creativity breeds creativity and a wheel in motion says in motion. I have taken over the spare bedroom so all of my fabric, books, patterns etc. are in the same spot, which is handy. I must confess, the room is in a constant state of chaos, but I like it that way! Okay…enough about me!! Let me introduce you to Ruth Quinn at Stitching Impressions. Ruth (a fellow Canadian!) will write her post on Monday November 17. She is a quilter who also loves to hand applique. and has actually completed Lily Rosenberry! Ruth is a talented longarm quilter who spends most of her waking hours machine quilting for others, including Patti Carey from Northcott Fabrics. But as you will see, she is talented in many other ways! My apologies for not including the information regarding my new hoop. It is made in Canada by Quilters Woodwork in St. Mary’s, Ontario. 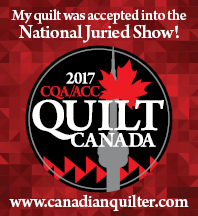 I purchased mine at a local quilt shop in Cookstown, Ontario called Country Concessions. When I can get my hoop away from the cat, I love to sit and hand quilt in the evening. Here is my Grandmother’s Flower Garden, which I am currently working on. I am already thinking about my next hand-quilting project. I don’t like too much time to slip by between projects, because the callouses on my fingers soften and then I have to go through the whole process again! Maybe I will take the time to put the rest of my Grandmother’s Choice blocks together so that I have something to hand-quilt. These are the fabrics I am considering for the sashing and borders. Pretty pink! I mentioned in an earlier post that my Civil War Bride Quilt won a ribbon at the local Ploughing Match. The quilts were judged and awarded ribbons back in May and the ribbon winning quilts were kept until the Ploughing Match, which was held in Essa Township while we were in Barbados. So, I just recently was re-united with my quilt. Yippee! I had no doubt that it would be kept safe and sound, but the fact that I had a more than one dream about my quilt disappearing made me think that maybe it was on my mind more than I realized. I was pleasantly surprised when I came home from running errands yesterday to find that the my Hubby has taken the time to hang the quilt in the livingroom. What a lovely sight!